2003 saw the original release of John Foxx and Harold Budd's ambient album Translucence/Drift Music, with the pair having originally struck up a recording relationship in 1996. Translucence/Drift Music was formed from the music that came out of those studio sessions, splitting their work across two discs and now the records are set to be released on vinyl for the first time alongside the pair's 2011 collaboration with Ruben Garcia, called Nighthawks. That album has been dedicated to the memory of Garcia who sadly passed away a year after its original release. "Harold Budd recommended Ruben Garcia's music to me - and that alone is a significant achievement for any musician," Foxx says. "His album Room Full Of Easels illustrates why Harold was so intrigued. It's inventive, tranquil and joyful music from a pure spirit – a truly independent and idiosyncratic artist. I count myself very fortunate to have been involved with a small part of the recorded music Ruben left behind." The reissue of the three albums has been released via Demon Records in a 3xLP package and can be purchased here. You can read on below for a track-by-track guide to Translucence, Drift Music and Nighthawks by John Foxx himself, and you can have a listen of the records above. 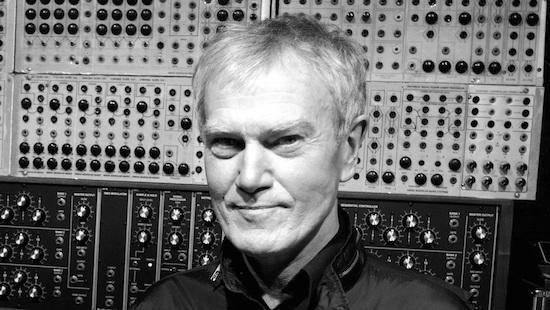 John Foxx: I first met Harold at an event run by my friend from art school, Russell Mills. He’s the artist who made the cover for ‘The Pearl’ and David Sylvian’s solo records, as well as dozens of others - most recently Nine Inch Nails. Russell is a natural catalyst - always suggesting meeting people or recommending new records, artists, places etc.” You’ve just got to listen to this – its really important” - and he’s always right. He’s the one who played Gary Numan’s first Tubeway Army record to me, and introduced me to Arvo Pärt’s compositions, for instance. A man of wide and impeccable tastes. Russell lived in Vauxhall, which was very rough at the time. I remember he played us some hilarious tapes made by Eno of the storytelling during Bowie’s sessions in Paris. There was a great scene in Vauxhall then, in the squats nearby where I first heard early Acid from Detroit in the late 1980s. A small group of us would go to the Fridge in Brixton where Leigh Bowery was always dressed as some semi abstract life-form. You could feel a new era was beginning. I remember at that event Russell put on in the church, Vaughn Oliver, who did all the marvellous 4AD artwork, projected his new films, Dead Can Dance performed live, I did my first performance of Cathedral Oceans with projections, Eno turned up with Terence Stamp - and Harold Budd. I didn’t much chance to speak to Harold at the time, there were some Australian journalists who wanted stuff for radio, plus my genuine awe of Harold – I really loved his music - so the opportunity was lost. But Russell later said Harold had enjoyed the music and was interested in meeting up at some point. JF: Some considerable time later me and Harold did meet. I played him some primitive imitations of his music and explained what I thought we might do. As usual, Harold was magnanimously easy about it all and so we arranged the sessions in Yorkshire, at the house of my artist friends, Judy and Gordon Cain. It’s a big old stone place and we put the piano in a room overlooking the garden, which was all nicely overgrown. I set up the piano so that Harold could play along with the effects I’d arranged for him. I wanted to take off from the point where ‘The Pearl’ left off, but using the piano as the real focus - in fact the only focus - of the recordings. I especially wanted to extend the harmonics of the piano strings resonance and sonic decay and use that as a live, real-time expansion of the sound. Harold listened, enjoyed the things I’d set up - and so we set to work. JF: I think Harold is a modern day Satie. I don’t say that lightly - Satie is my favourite composer, as well as a seminal music philosopher. Among other things, he invented the central concept which would enable modern music to move forward – furniture music, music to create a quietly luminous and tranquil environment. A precursor even of minimalism and the precise opposite of Wagnerian orchestral ‘Sturm Und Drang’, which was the dominant style of his period. By quietly sticking to these ideas, he revolutionised music and slowly became universally visible, through his quiet tranquil pieces such as 'Gymnopedies'. I believe he’ll eventually be seen as the most significant and pivotal modern composer. Harold has done something similar for this era by understanding the implications of recording. I’ll try to explain. When you record music, you capture a moment forever. You can replay it and examine it minutely, the microphone can zoom right in – it’s the aural equivalent of a cinematic close-up. Actors have to realize that their faces will be projected forty feet high. So it’s enough for an actor to simply think the emotion that needs to be conveyed, and the audience will pick it up, since we are all so finely attuned to interpret the most fleeting facial expressions. So with the recorded piano. The microphone supplies an intimate close-up of the instrument. The most minimal and intimate gestures are the most appropriate. Any concert-hall Rachmaninoff over-playing becomes as grotesque to the listener as some theatre trained actor over-emoting in close-up, looks to a cinema audience. Harold has always intuitively and intellectually understood all this. And through listening to the implications carried in his music, so have I, and I’m truly grateful for it. This is the way forward, a way out of the accretions of Classical Music and Jazz and other conventions. If you can observe, respect and understand the intimacies and possibilities of recording, you can begin to revel in all the possibilities, the sheer human beauty and seeming paradox of an infinitely replayable, vanished moment. In music recording, we are really only at the point painting was a hundred years ago, in the time of Picasso and Braque and Matisse – they sought a new, more humane way of painting, where gesture, spontaneity, even accident and imperfection, became an integral part of intimacy and beauty - the opposite of the predictable, claustrophobic perfections required by the academic strictures of the time. Harold has quietly pursued his vision, often against the tides of conventions and cliché - atonality, serial music, etc.- and outside any easy categorisation. In doing this he’s unintentionally become a valuable island of integrity. A steadfast, admirable figure respected for his pursuit of clear aims. From the first moment I heard Harold’s music, I and many others, realised all this. JF: At the start of the first recording session, we put a reproduction of a Howard Hodgkin painting on the piano, as the score. Harold took it away later. I think he simply liked the view from the window into the garden. He played all his parts and pieces straight off, maximum of twice, most usually once, after an initial rehearsal, which would last all of ten minutes, so I had to be on the ball with recording - you wouldn’t get a second chance. He was gloriously relaxed all the time, never abrupt. He said he didn’t have a piano at home any more. He’d had a nice Bluthner or Steinway but had got rid of it. JF: He often works in hints, without explaining anything. For instance, he played a cycle of chords. They hinted at all kinds of dark melodies and arrangements, bigger complexities - I thought 'what can I do here'? But I knew I had to go the other way, to take that to a minimum - play a few late-night things. That’s what worked. The track came to be named ‘Implicit’. To make it work I had to learn how to become The Invisible Man. (That later became a track on ‘Nighthawks’). JF: My main memory of the recording is the track that became ‘Spoken Roses’. Harold simply sat down, took out a few notes he’d made of some changes, wrote a few notes in, then played two complete versions, both of which are different but equally beautiful. I was transported by this piece. It felt suspended in the air like a new form of life, a slowly revolving, illuminated thing. JF: I often hear comments on the background synthesiser work. Actually, very little synthesiser was used on Translucence and Drift Music. In most instances - particularly those glorious background landscape harmonics - the sounds are derived entirely from the piano’s natural resonances, transmuted, multiplied and overlaid through the use of reverberation, delays and some compression. Harold and I used these as a sort of orchestration and extension of the piano. They lead into another way of playing, by supplying an ecology of sound that encourages ideas and improvisation. An ocean of possibilities, where notes can bloom in unforeseen ways. JFL When I came to mix the Translucence and Drift Music albums, I asked Louis Gordon to work with me. He’s an alert, sensitive musician and had a very good system supplied by Roger Lyons, a friend and sound man for New Order. Also lots of great, complex reverberation plug-ins by Ohmboyz and others - I had my ancient Space Echo and a great old Alesis reverb box with lots of extremely long reverbs I’d prepared and used on the sessions. We also used another completely unique property of recording - reversed time. By reversing sounds and recording reverbs, then playing them forward and applying further layers of reverberation, you can enrich the already extended harmonics. You also have the miracle of reverberations moving simultaneously forward and backwards in time, and a truly complex interplay and texture going on between them. We took all this layering and multiplying as far as we possibly could, while still observing the delicacy and emotional tone of the pieces. All you have to do is listen and feel. JF: Later in the sessions, after we’d recorded enough basic tracks for an album, Harold played through some fragments of ideas, all of which were beautiful and promising. I recorded them for working on later, knowing it would be possible to edit and add parts, which would yield more pieces. When I listened to them at home I realised there was another album there. Some of those pieces became Drift Music, some were components and stand alone pieces on Translucence, among them ‘The Other Room’, ‘Missing Person’, ‘Linger’, ‘Momentary Architecture’ and ‘A Change In The Weather’. One memorable moment was ‘Stepping Sideways’. I walked out of the room and left the machines running for a moment and he’d recorded it. All I had to do was play it back. I still have many other things he played through on that last session that I still want to work with. Harold enjoys a pint of good British beer and so do I, so we’d often retire to the pub nearby for a talk and a winding down after recording. We never worked late. It was all done at a pleasant pace, exactly as the music sounds, I think. Absolutely the best recording experience I’ve ever had. JF: Nighthawks was completely different. I’d been recording street sounds and subway sounds from gratings and tunnels in New York, as well as taking photographs and films in the rain at night, often from a few floors up, in whatever building I happened to be in at the time. I also remember one beautiful evening high up in the Rainbow room, where snow was swirling magically around the buildings in wind patterns that only skyscrapers can make, a uniquely New York vista. I’d also become very interested in Film Noir background locations in New York and Los Angeles and had written to Harold about the idea of making a sort of modern Film Noir music. The recordings he and Ruben Garcia sent me some time later seemed right on the button for this. First, I placed these recordings into an environment made from the subway and street sounds I’d gathered. That completed the timing and the atmosphere, and enabled me to play and record my parts. I wanted it all to move from glorious rooftop light to lost hotels and dark, rainy streets at night.